excuse the blurry iphone pic. i didn't intend to post anything about this soup today. my intention was to make something really healthy to eat in the hopes of getting better faster. but i was kind of impressed with the results so i thought i'd share it anyway. i used spinach, asparagus and leeks in this soup–no broth. pureed together, the ingredients were flavourful enough on their own. 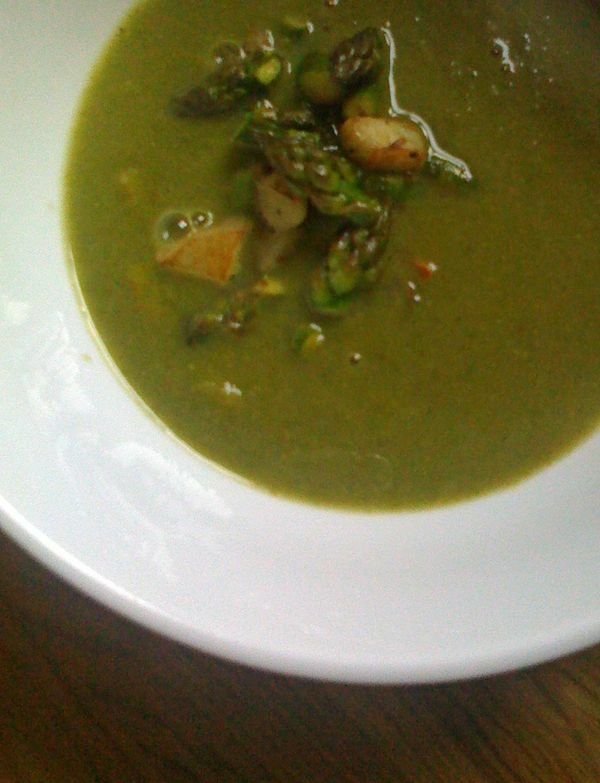 while the soup simmered, i sauteed some reserved asparagus tips, garlic and the sunchoke i used to thicken the soup, and garnished my soup with them. it looked pretty, tasted delicious which made me feel better, of course. now hopefully those vegetables will get in there and kick the cold right out of me. i hope it cures you…fellow domestic goddess! thanks! one of your lavender cookies would really help. I was kicking myself the next day for not taking the leftovers.